On Monday, Azusa Pacific University commenced its month-long celebration of the anniversary of the King James Bible. I had the privilege of traveling to APU to take part in a rich day of events that began with a stirring trumpet herald and ended with an unforgettable, hypnotic performance by the Men’s Chorale. Twice I visited the university’s art gallery to take in Makoto Fujimura’s The Four Holy Gospels, a stunning abstract rendering of the scriptures, which I mentioned some months ago in this blog post about the Museum of Biblical Art (MOBIA) King James Bible exhibition. Somewhere in the midst of all of this I delivered two talks based on the Folger’s Manifold Greatness exhibition. As a curator, delivering a PowerPoint presentation is never quite as satisfying as showing real artifacts. As good fortune would have it, the University’s Special Collections had put together an fine exhibition called “Creation and Illumination: The 400th Anniversary Celebration of the King James Bible.” The books and manuscripts they had on display augmented my talks perfectly. My hosts took me for a tour through their library’s vaults, where we pored over an assortment of wonderful books. I felt very much at home. Aitken Bible. 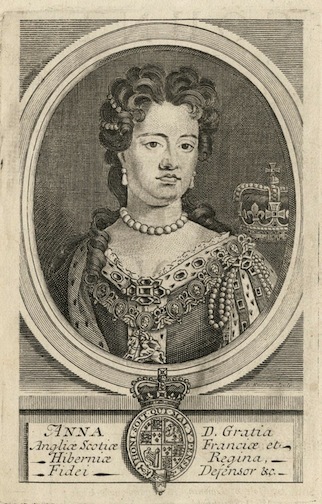 1782. Library of Congress. A post about the Folger Institute’s recent King James Bible conference by Adrienne Shevchuk, program assistant to the Folger Institute, recently appeared on the Folger Shakespeare Library blog, “The Collation,” and we wanted to share some excerpts here. Adrienne has a master’s degree in Shakespeare Studies, with particular interest in film adaptation. 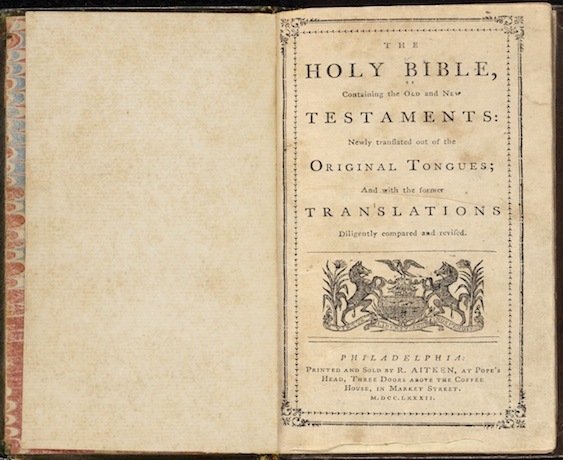 You can read her full Collation blog post here—including a fascinating anecdote about Ben Franklin’s playful ways with the King James Bible. 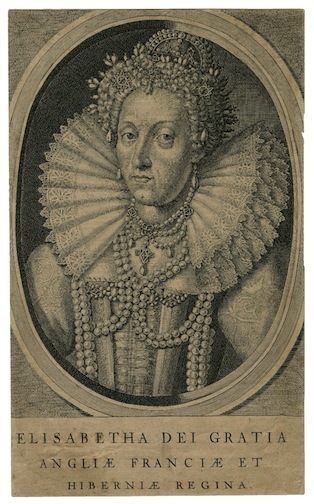 As part of the Folger Shakespeare Library’s celebration of the 400th anniversary of the King James Version of the Bible, the Folger Institute hosted a conference bringing together scholars from across the United States and the United Kingdom to discuss the effect of this Bible on social, cultural and political societies of early Stuart England and colonial America. The breadth of discussion in the conference, entitled An Anglo-American History of the KJV, took us far beyond the king’s castle and our New England and Virginia roots, however, demonstrating how the language of the KJV was disseminated throughout the various regions and cultures of the United States, including its translation for the native Cherokee nation as well as its role in the lives of slaves and later emancipated African Americans. The keynote speaker to kick off the conference was Jill Lepore, novelist, professor of American history at Harvard University, and a contributing writer for The New Yorker. Professing, humbly, to know more about psittacosis, or parrot fever, than the KJV, Professor Lepore nonetheless presented a packed theater with an early American reception of the KJV that was quite different from the one it received on its home turf. That is, while it could be argued (and was throughout the first day of the conference) that James himself wasn’t zealous about the distribution and use of the 1611 version over all others, allowing for a lukewarm dispersal and reception in Britain, colonial and postcolonial America grappled with the KJV, either accepting it into religious life or expelling it completely. Forbidden by decree to print Bibles, colonists had to bring their Bibles with them, or order them from England. However, in 1775, when British imports were banned, Americans began printing Bibles on their own. His edit of the KJV turned out to be a failed endeavor. In spite of that, however, Professor Lepore’s witty and informative lecture described a patriotic man and a young country, desperate to step onto the world’s stage away from the shelter of the British colonial umbrella, on its own terms and with its own language. Professor Lepore’s talk is now available as a Folger podcast. 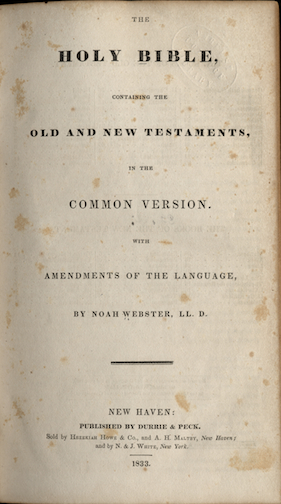 For more about the 1782 Aitken Bible (also called “The Bible of the Revolution”), Noah Webster’s edit of the King James Bible, and more, see the Historic American Bibles image gallery in our Manifold Greatness website. Adrienne Shevchuk is the program assistant to the Folger Institute. 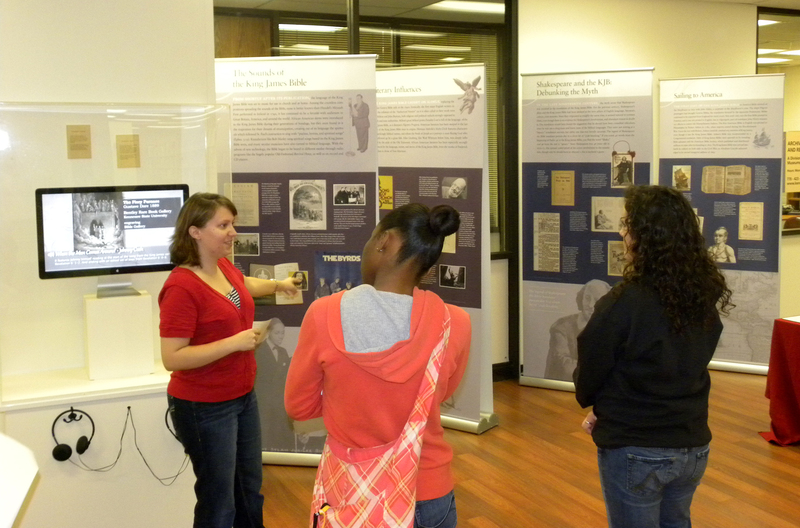 Student intern, Robyn Gagne, practices her tour with other docents. The simultaneous opening of Manifold Greatness: The Creation and Afterlife of the King James Bible and Kennesaw State University’s exhibit How God Became English: The Making of the King James Bible provided students an opportunity to hone their research and public speaking skills as docents. Eight students have been reviewing exhibit materials, attending workshops with Department of Museums, Archives and Rare Books staff, and preparing tours over the last several weeks. Without these individuals’ enthusiasm and commitment, the Department of Museums, Archives and Rare Books would not be able to provide the visitor with the type of educational engagement for which we strive. The docents contextualize the materials on display and provide connections between the two exhibits that enrich and enhance the information presented. 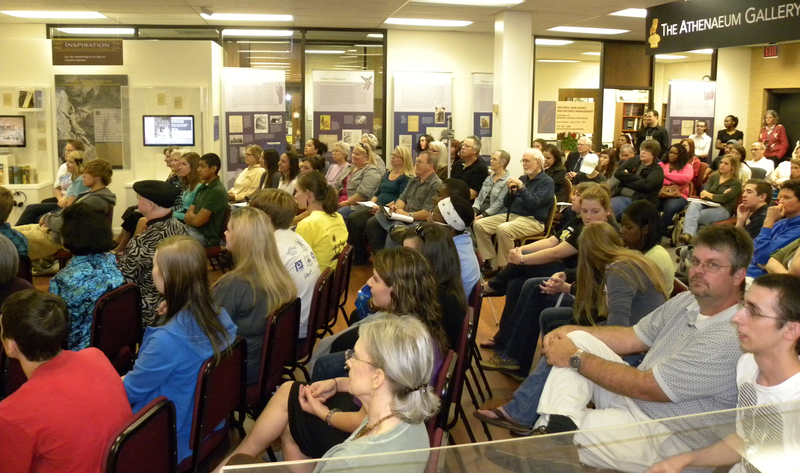 A large crowd gathered to hear four Kennesaw State University faculty discuss the history and language of the King James Bible. For more information on these events, please visit our website at www.kennesaw.edu/kingjamesbible. 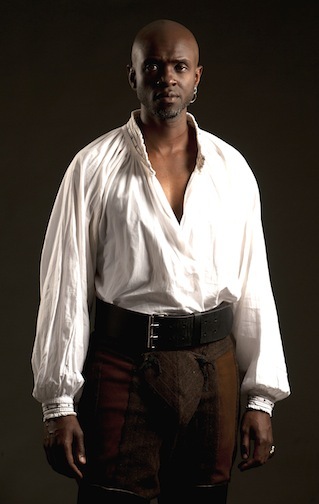 Owiso Odera as Othello in Folger Theatre's 2011 production. Photo by James Kegley. Most people today think of Othello as a play about race. This has been a common view for decades. Indeed, U.S. President John Quincy Adams (1767-1848) thought the play a failure because of its representation of a young Venetian girl making “a runaway match with a blackamoor.” The play was a hit in the pre-Civil War South, since it offered, so it was believed, a lesson in the dangers of miscegenation. Audience react to the play differently today, but they still focus on race. Tragedy of Othello (quarto). 1622. Folger. In Shakespeare’s day, before the expansion of the transatlantic slave trade, what was most risqué about Othello was not race but religion. Othello is a Christian, it’s true, but he is descended from Muslims. Shakespeare’s subtitle The Moor of Venice would have suggested Islam as well as blackness. And the conflict that threatens Venice in the play is with the Muslim Turks. One of the most overt biblical allusions in Othello is in Iago’s early speech, when he says to Roderigo, “I am not what I am.” At first hearing, this sounds like Viola’s coy remark in Twelfth Night, “I am not that I play.” But it’s more complex. Iago’s statement is actually logically impossible. How can anyone not be what they are? The key is that Iago is parodying God’s naming of himself to Moses in Exodus: “I am that I am.” It’s not a name, really, but a statement of God’s eternal sameness and essential being. Iago inverts this, which implies something essential unstable or even empty about him. Owiso Odera, Ian Merrill Peakes. Othello, Folger Theatre, 2011. Photo: James Kegley. Another important reference to the Bible comes at the end of the play when Othello says that he, “like the base Judean, threw away a pearl richer than all his tribe.” (Though some editors argue for “Indian” rather than “Judean.”) The “Judean” in question is Judas, who, according to the note in the Geneva Bible (with the later “Tomson” New Testament), was of the tribe of Judah. The “pearl” Judas threw away was Jesus, whom he betrayed, and who was also of the tribe of Judah. Because he has betrayed and murdered Desdemona, Othello is thus likening himself to the greatest betrayer in Christian history. Othello later says to Desdemona’s body, “I kiss’d thee ere I kill’d thee.” A biblical literature audience might hear this as an echo of Judas’s kiss, which identified Jesus to the chief priests and elders. 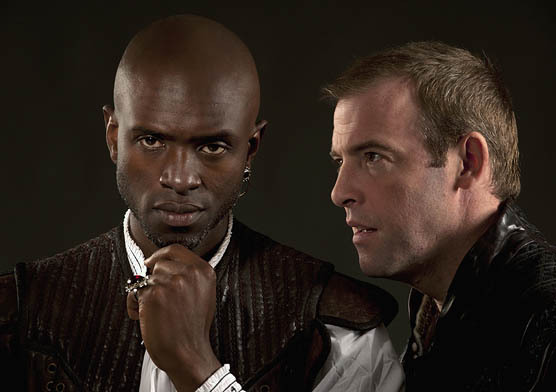 The Folger Theatre production of Othello opens October 18 and runs through November 27. 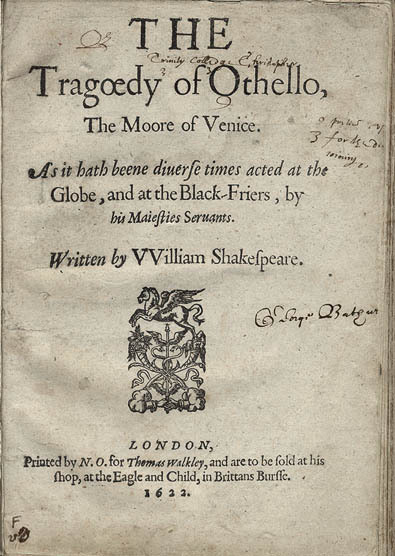 Othello was performed at James I’s court in 1604, the year that work began on the 1611 King James Bible; scholars believe Shakespeare wrote the play in 1603 or 1604. Robert Pinsky. Photo: Dodge Hanson. Poet Robert Pinsky read from his poems and from his prose book The Life of David on Tuesday evening, October 4, 2011, as part of the O. B. Hardison Poetry Series at the Folger Shakespeare Library, an event introduced and moderated by Folger director Mike Witmore. The Life of David is an imaginative portrait of David, the biblical warrior, poet, and king. It was my editor Jonathan Rosen’s idea for me to write The Life of David. I protested that I lacked scholarship, couldn’t even read Hebrew. Jonathan said that was irrelevant: the goal was not a work of scholarship but a writer’s understanding of that greatest of lives. So, along with embracing David’s life story as it is told in Samuel I and II, the book needed to be informed by how that story and its telling had become part of the English language itself, embedded there by the hundreds of writers who had inspired me to write. Implicitly, I needed to respect how the biblical text had formed Milton, Swift, Keats, Austen, Lincoln, Dickinson, Joyce, Faulkner, Stevens, as well as others, great and less great—and how the writers in turn had formed our understanding of David’s story and of the Psalms that are designated as being “of” David. These are the considerations that compelled me to decide, in a book published in 2005, that all the quotations must be from the King James translation, with its countless and still increasing echoes. 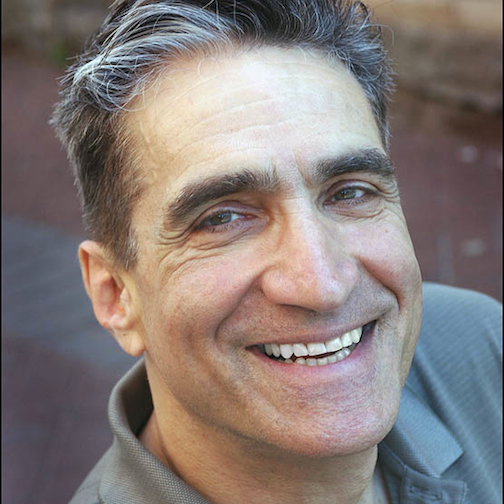 Robert Pinsky, who served an unprecedented three terms as United States Poet Laureate, teaches at Boston University and is the poetry editor of Slate. His books of poetry include Selected Poems, Gulf Music, Jersey Music, and The History of My Heart. He is also the author of the prose book The Life of David and is a well-known and award-winning translator. He has written several books about poetry including Poetry and the World, which was nominated for a National Books Critics Circle Award, and The Sounds of Poetry. 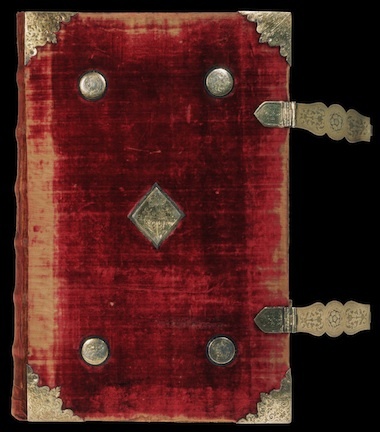 Prince Henry Bible. Washington National Cathedral. Photo: Julie Ainsworth. 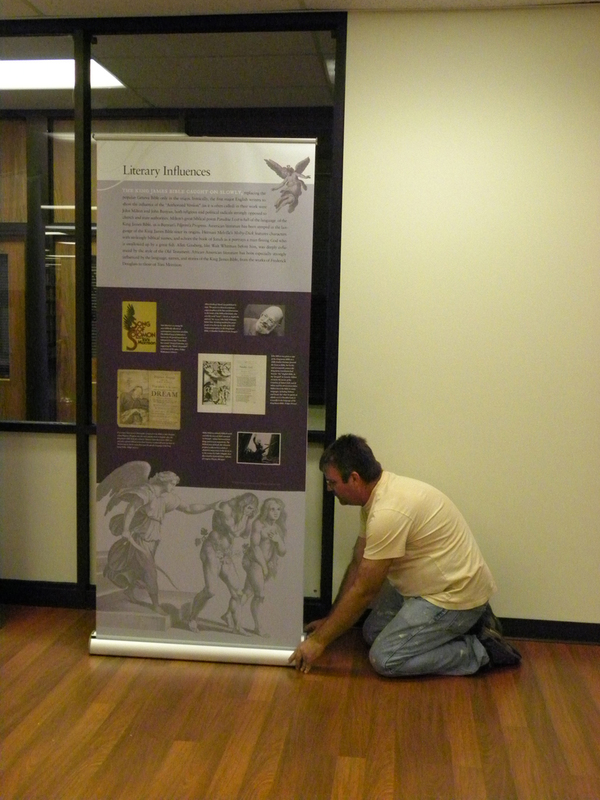 When planning an exhibition a curator expects to find a few discoveries and surprises. In earlier posts I’ve written about discoveries such as the Isham Bible and the surprise of finding a “Judas Bible” in the Folger collection. But there is one artifact in the Manifold Greatness exhibition that we would never have imagined: a copy of the 1611 “He” Bible that was bound for King James’s son Henry Frederick, prince of Wales. 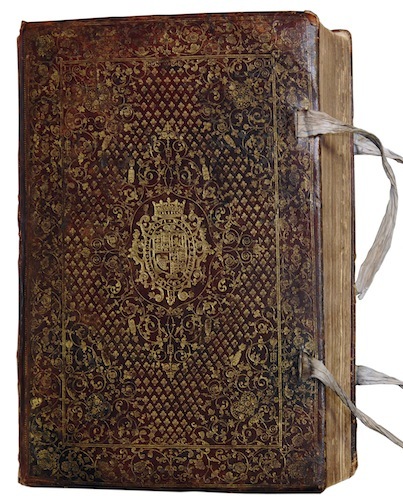 This treasure is undoubtedly one of the most exciting surviving editions of the King James Bible and, as good luck would have it, it was residing just a few miles from the Folger Shakespeare Library at the Washington National Cathedral. 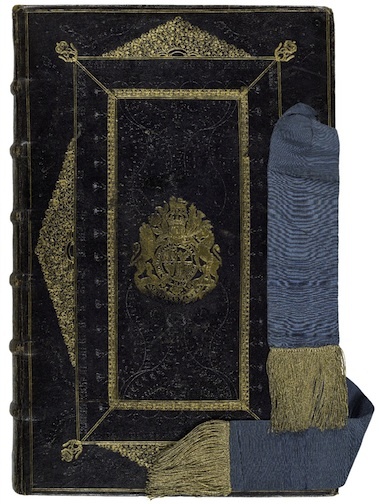 As you can see from the photograph, this book is bound beautifully in red Morocco leather with intricate ornamental gilt tooling that provides clues identifying both the owner and binder. Prince Henry’s arms are stamped onto the front and back boards, along with royal symbols such as the crowned thistles on the corners of the binding and Tudor roses sprinkled around the border. If you look closely at the detail below, you’ll see two little squirrels perched on each side of the crown found on Henry’s arms. There was only one binder during this period who decorated his bindings with such squirrels. We do not know the binder’s name, but modern scholars have taken to calling him the “Squirrel Binder.” Active from c.1610 to 1635, the “Squirrel Binder” appears to have worked for many English nobles and several members of the royal court, including James I, Charles I, and Prince Henry. Detail, Prince Henry Bible. Washington National Cathedral. Photo: Julie Ainsworth. The book’s engraved title page held another surprise. The signature of the engraver, Cornelis Boel, usually appears engraved at the bottom left center “C. Boel fecit [he made it]” On the title page to Prince Henry’s copy, Boel’s name is not engraved, but signed! This extraordinary copy of the “He” Bible is the greatest treasure of the Washington National Cathedral’s impressive rare book library. I know that I speak for Hannibal and the rest of the Manifold Greatness team when I say how grateful we are to our friends at the Cathedral for loaning us this remarkable book.